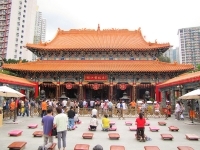 This grand Taoist temple is one of the most frequently visited temples in Hong Kong. It is dedicated to Wong Tai Sin, a legendary hermit who reputedly had healing powers and could foretell the future. A number of fortune tellers ply their trade in the temple complex and there is also a large pharmacy. There are some English-speaking fortune tellers (although they are more expensive) and they offer a number of soothsaying techniques including palm and face reading. The ornate temple with its red pillars, gold ceilings and decorative latticework is in the traditional Chinese style and is usually full of people burning incense and making floral offerings. The temple is known as a place where 'wishes come true' and locals come to pray for good health, success in business and happiness. Visitors can buy incense to burn just outside of the temple but there are usually lots of spare sticks left over from previous visitors within the temple itself so buying more may prove a waste of money. Those who do buy the incense need not purchase the whole kit as everything other than the sticks themselves will be taken by the guards at the entrace to the temple proper. The temple also has a lovely adjacent park called the 'Good Wish Gardens', a peaceful green spot with waterfalls tumbling over rocks. Opening times: Daily 7am to 5.30pm, gardens closed on Mondays.